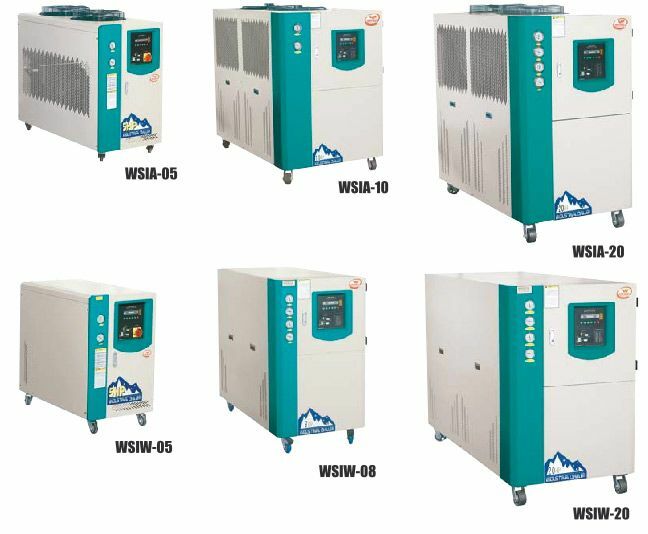 The water chiller is to provide cooling process to plastic moulds to improve molded products quality & cut down injection cycle time . Hence maximizes plastic molding machines’ productivity. Installed with import compressors, highly efficient shell condenser and evaporator, excellent cooling, quiet and low electricity consumption. Microprocessor control, easy to operate. Unique open reservoir tank made of stainless steel, easy cleaning & maintenance. Installed with precise electronic thermostat accurately maintains temperature within 3C-5C. Installed with current overload protector, high & low-pressure switch,electronic timer delay , fault display system. Screen liquid crystal display of chill water outlet & inlet with temperatures setting(Options avaliable). Single, double or four compressors combination unit available & high power efficiency. Industrially designed , elegant and ergonomic.